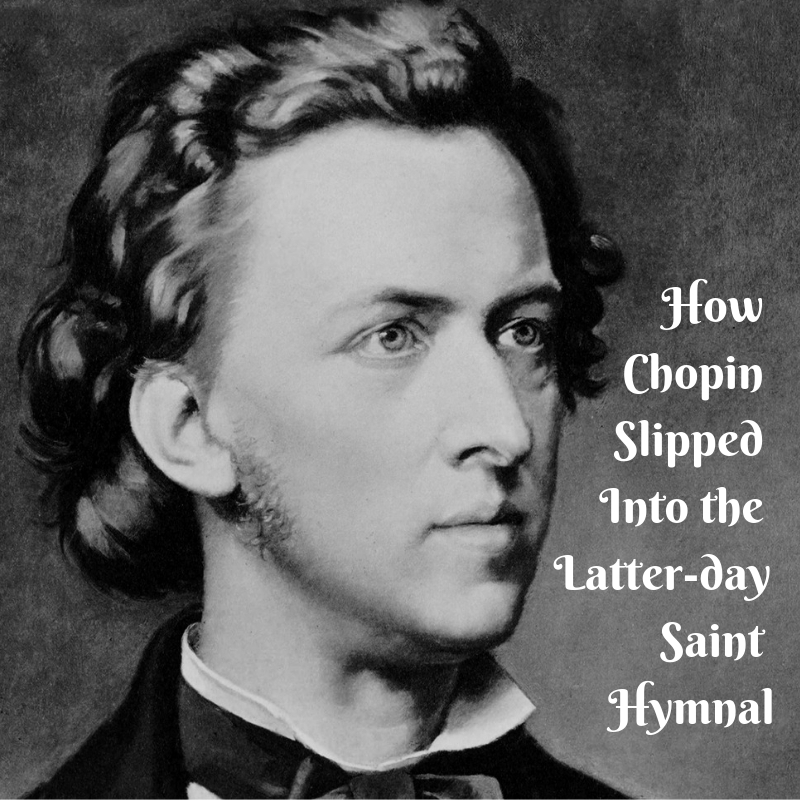 I’ve always found it incredibly interesting that the lives of Joseph Smith and Frederic Chopin were almost simultaneous, and almost exactly the same length. Joseph Smith was born in 1805 and died in 1844. Frederic Chopin was born in 1810 and died in 1849. They were only 5 years apart and lived the same, short number of year. They were both 38 years old when they died. And that in itself freaks me out because I just turned 38 a couple months ago. Thinking about how much these men accomplished in their short lives makes me feel like a major slacker! One of the hallmarks of Chopin’s music was a special, romantic, sighing kind of harmony. This harmony appears in many of his pieces throughout his life. But it became more and more prevalent as he approached his final illness and death. His last few Mazurkas are full of this kind of sagging, descending by half-steps, kind of harmony. It is a very melancholy sound, which is fitting, as he was a very melancholy man. There’s Chopin’s life in a nutshell. I have always loved the music of Chopin, and have played quite a lot of it. But when I was a student in Warsaw, finishing up my doctorate as a Fulbright scholar, I became much more intimately acquainted with it. Having been exiled from his homeland, and watching from afar as they struggled against foreign regimes, Chopin was filled with nostalgia and angst. The beautiful Polish people, having been so often conquered, tortured, re-conquered, ruled over by vicious dictators, are resilient re-builders. But they remember their challenges. They are fresh in their memory. On nearly every street corner in Warsaw there is a plaque or monument to an uprising against this regime or that potentate. They were very often pilgrims in strange lands, forced to leave their home. The same was true of Chopin. The same was true of many Latter-day Saints, those who left their homes abroad to come to American and follow the Prophet, and those who were kicked out of city after city until finally settling in the West. So a Chopin-esque harmony makes a lot of sense to me in this hymn. With all this wonderful, adventurous, dramatic harmony, I wonder if it goes a little too far. Perhaps not. Maybe it’s just the music nerd in me. But when I sing or play this hymn, I completely lose track of the tune. My attention goes straight to the harmony. I don’t find it to be a particularly inspired tune. It’s adequate. But for my ears, it’s lost amongst all the harmony. That is one thing Chopin would not have done. He would never have sacrificed his melody for interesting harmony. He was an incredible melodist. His harmony was as adventurous as any Romantic composer, and much more than some. But it always supported the melody without eclipsing it. If there’s a fault in Hymn #121, it’s that the harmony, at least to my ears, eclipses the melody. So, let’s have a look under the hood at all this harmony stuff. Let’s go bar by bar. Bar 1 — Nothing too intriguing. A 1 chord and a 5 chord with the 7th in the bass. And, theres a little suspension in the soprano, the G hanging over from the previous chord which resolves down to F.
Bar 2 — It starts with another 1 chord, but this time in 1st inversion, with the G in the bass. Now we get our first Chopin moment. The sagging chromatic bass line, G-F#-F. The 2nd chord, the F# diminished 7th chord is interesting. Normally diminished chords built on notes outside the key signature, and on sharps, they usually resolve upwards. The F# would go up to G and the chord would usually be G minor, in this key. But in Chopin-esque fashion, the composer lets the diminished chord sag down rather than raise up and we land on a B-flat chord with F in the bass followed by another B-flat chord, the 5 chord, this time with a 7th on it, the A-flat. Bar 3 — The phrase restarts with the same chord as the opening chord of the hymn. But now we have a pedal E-flat through the bar with a dominant 7th chord on E-flat, the one with the D-flat. This resolves to an A-flat chord, still with E-flat in the bass, and then back to a regular 1 chord. Bar 4 — At first it looks like a regular end to a phrase. The bass goes 4, 5, 1 with a 2 chord, a 5 chord and a 1 chord. But Robertson slips in a foreign chord by pivoting on the G in the soprano. Beat 4 is a G7 chord with F in the bass. This sounds like he’s about to slip into the relative minor key. Remember those? That’s the minor key that shares the same key signature with the major key. In this case, we’re in E-flat major, so the relative minor key is C minor. And a G7 chord is the 5 chord in that key. So by ending the 1st line on that G7 chord, especially when it has the 7th in the bass, our ear expects to hear some C minor coming next, and probably in 1st inversion, with E-flat in the bass. Bar 5 — He does eventually get to the E-flat in the bass, but not straight away. First he makes he decides to do that same sagging Chopin thing where he takes the bass down by half steps. This time the F from the last chord of bar 4 sags to the E-natural and then E-flat in bar 5. He starts with another fully diminished 7th chord outside of the key, built on E-natural. When the tenor moves to the A-natural, the chord becomes an A7 chord with E in the bass, the D-flat is basically a C# in that context. Then the sagging bass finally arrives on the E-flat underneath a regular 4 chord. Bar 6 — Now the bass reverses it’s direction and starts slithering up the chromatic scale. E-flat 7, then up to E diminished 7, then F minor, and then what looks at first like an F# diminished chord. But it’s not. The chord is A-flat, C, E-flat, F#. If you re-spell the F# as G-flat, you’d have an A-flat dominant 7th chord. But, since it’s an F#, this is what we call an Augmented 6th chord. The A-flat to the F# is an interval of an augmented 6th. The F# resolves up to G and the A-flat resolves down to G. This corroborates our previous thoughts of slipping into the key of C minor. This is a German Augmented 6th chord in the key of C minor. This chord normally resolves to a 1 chord in 2nd inversion, or, in this case, a C minor chord with G in the bass. Bar 7 — The Augmented 6th chord does resolve correctly and we start bar 7 with a C minor chord with G in the bass. After leaping up to the B-flat and turning the C minor chord into a C minor 7 chord, we get a regular F minor 7 chord (4 chord in C minor) and another C minor chord with G in the bass. It sounds like we’re going to have a full on cadence in C minor. Bar 8 — But, yet again, our expectation are dashed. The harmony repeats itself a bit. F minor 7, to the F# in the bass which is that same German augmented 6th chord. But this time, instead of resolving the German augmented 6th chord to a C minor chord with G in the bass, it goes directly to a G7 chord in root position. It sounds like a half cadence in C minor. But it doesn’t last long because the bass is still on the move, stepping down to F.
Bar 9 — And now comes the big Chopin moment. Instead of any semblance of a cadence, we despair our way through 3 diminished chords in a row. E fully diminished 7, then dropping to A half diminished 7 with E-flat in the bass, then D half diminished 7 with a suspension in the soprano, extending the yearning. Very “heart-on-sleeve” writing, just like Chopin. Bar 10 — It was so fun the first time, why not do it again?! It doesn’t happen quite the same, but it’s similar. F minor 7 sags down to F half diminished 7 with the C-flat in the tenor. Then we get a G minor chord with B-flat in the bass and a very rare chord at the end, an Augmented triad. Instead of B-flat, D, F, we get B-flat, D, F#. The F# acts like another sagging sigh between the 2 G’s on either side of it. Bar 11 — With only 2 bars left, we have to get some sense of a home key going here pretty quickly. But before that, Robertson sneaks in a few more chromatic yearning pleas. First a 1 chord turned into a dominant 7th chord, and with the 7th in the bass. After 2 beats of that, we expect it to resolve down, as it should, to an A-flat chord, the 4 chord, but in 1st inversion, with C in the bass. The bass does resolve properly, but rather than an A-flat chord, he sticks the knife in just a little deeper with an A-natural, turning this into an A diminished chord with C in the bass. It’s followed by an F7 chord, the 5 of 5, then we finally get a regular (well, almost regular) dominant 7 chord that finally resolves to the 1 chord. What’s unusual about the final 5 chord is the un-resolved, hanging suspension. Bar 12 — The C in the soprano on the downbeat carried over from the previous bar. It should then step down to a B-flat. But like an immigrant ripped from his homeland, the suspension is left hanging and the soprano leaps down to the low D before finally resolving. Phew, we made it! What a chromatic journey! But very well written and expertly modeled after one of the greatest composers of all time. Ladies and gentleman, don’t try this at home! Adult supervision is needed to avoid any catastrophes. If yesterday’s hymn felt adventurous harmonically and one that is unknown to most, this hymn makes it look tame and well-known comparatively. I find the text very compelling, and much more so than some of the other first-person texts that we have come across to this point. I find it a more vivid picture of our need to rely on Heavenly Father than some of the other pleas. The tune was written by Leroy Robertson in fulfillment of a class assignment while at the New England Conservatory of Music which he later adapted to this text. Leroy Robertson is one of the greatest LDS composers and you can see him practicing his compositional chops with this hymn. The chromaticism lends itself very well to this text. There are times when the text matches perfectly with the given topics for speakers, and thus has been sung in wards I have attended (only because I have been the one selecting the hymns), and it doesn’t seem to big a challenge for the congregation to sing this. I would play the entire hymn as the introduction, though, to let them hear it once. I have been pleasantly surprised with the last few hymns having appropriate tempo suggestions, but here we are back to the suggestion being far to slow. To really have the chromatic harmonic movement make sense and have direction, the tempo needs to be quite a bit faster, around 90-92 beats per minute. My registration would be heavy with 8’ stops, and I may or may not add anything on the final verse. Newer PostCan Little Black Dots Physically Heal You?